The AdvAnTedGe™ ProducT Line incLudes: Call Today! You SupplY the Food. 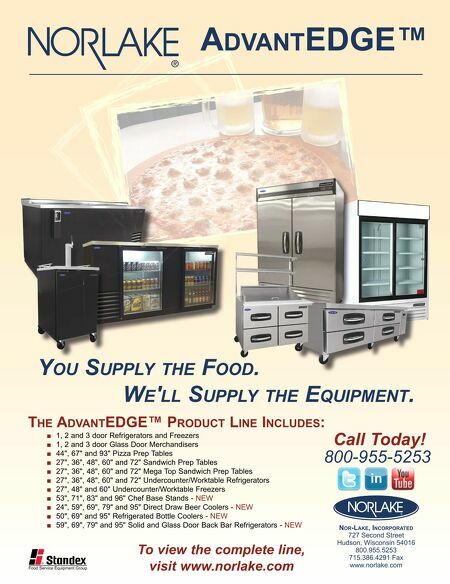 AdvAnTedGe™ nor-LAke, incorPorATed 727 Second Street Hudson, Wisconsin 54016 800.955.5253 715.386.4291 Fax www.norlake.com ■ 1, 2 and 3 door Refrigerators and Freezers ■ 1, 2 and 3 door Glass Door Merchandisers ■ 44", 67" and 93" Pizza Prep Tables ■ 27", 36", 48", 60" and 72" Sandwich Prep Tables ■ 27", 36", 48", 60" and 72" Mega Top Sandwich Prep Tables ■ 27", 36", 48", 60" and 72" Undercounter/Worktable Refrigerators ■ 27", 48" and 60" Undercounter/Worktable Freezers ■ 53", 71", 83" and 96" Chef Base Stands - NEW ■ 24", 59", 69", 79" and 95" Direct Draw Beer Coolers - NEW ■ 50", 69" and 95" Refrigerated Bottle Coolers - NEW ■ 59", 69", 79" and 95" Solid and Glass Door Back Bar Refrigerators - NEW To view the complete line, visit www.norlake.com 800-955-5253 We'll SupplY the equipment.